ALIVE! IS A FOUND OBJECT READY MADE SCULPTURE ALTERED WITH PAINT AND TEXT THAT READS: I AM ALIVE! YOU ARE ALIVE! THEY ARE ALIVE! WE ARE LIVING! I CHOSE TO WORK WITH A WIND TURBINE BLADE BECAUSE OF HOW IT ALTERS ONE’S PERCEPTIONS WHEN THEY LOOK OUT ACROSS THE DESERT LANDSCAPE. THEY ARE ENORMOUS AND WHEN VIEWING ONE UP CLOSE YOU GET A SENSE OF THE EXPANSIVENESS OF THE DESERT LANDSCAPE THAT THEY OCCUPY. THEY ARE ALSO REALLY BEAUTIFUL IN FORM AND THEIR SHAPE REMINDS ME OF SOMETHING LIKE A WING, A FIN, OR A BONE FROM A MASSIVE WHALE. 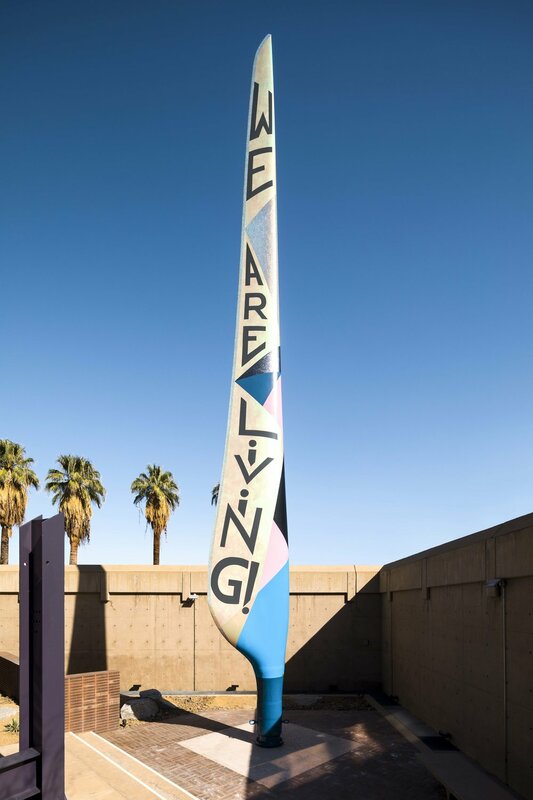 THE TEXT REFERENCES THE PEOPLE WHO LIVE IN PALM SPRINGS AND THE ORIGINAL INDIGENOUS PEOPLE WHO OCCUPIED THIS LAND AND THEIR BELIEF THAT THE LANDSCAPE IS LIVING. Viewable 24/7 from the street outside the Palm Springs Art Museum. For entry to the sculpture garden and the museum, hours are: Sun, Mon, Tues, Sat: 10am - 5pm, Thurs & Fri: 12pm - 9pm, closed Wednesday.